LYF | What Does LYF Mean? LYF means "Love You Forever". LYF is a line that features in many love songs and poems. It is typically used to vow a deep and lasting emotional attachment to someone until the end of time (forever). However, it can also be used casually as a throwaway line to add weight to a request for a favor. 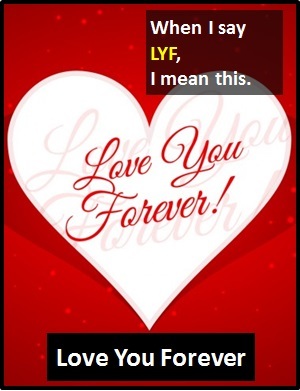 Of note, the abbreviation LYF can also be written as LY4E and ILYF. Charles: You are so beautiful. I will LYF. Diana: You are so handsome and clever. I will LYF too. Phil: Can I borrow your bike Dave? I will LYF. Dave: As long as you promise to look after it. The abbreviation LYF is used as a standalone declarative sentence (i.e., a statement). In other words, it is not used as a part of speech within a wider sentence. Before the digital era, we would have just said "Love You Forever" instead of using the abbreviation LYF.